No one. Saw an article online. I received my ST190 HL a week ago and have played 3 rounds with it. I'm more accurate than I was with my Ping G30, and the G30 was no slouch by any measure. My drives have been a few yards longer, maybe 5-7 yards. All in all, an improvement, especially given the time of year. Love the feel and sound, and the ST190 is definitely forgiving. My miss so far has been high off the toe, but the shots still find the fairway without losing a lot of distances. Obviously I don't know how this driver will work for others, but I'm very pleased with it. Good morning, everyone, How﻿ long have you been playing golf? What’s your handicap or﻿ normal score? Though I started at age 8, it was start-stop over the decades until the mid-2000's. I've been playing regularly since 2007. What do you love about golf? Every day and every shot is unique. Plus, I love the ideal that if you play golf, you're my friend. 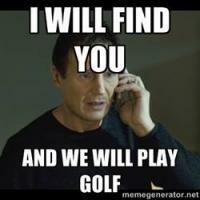 What bring﻿s you to MyGolfSpy? Do you already know any other Spies? MyGolfSpy has had my email for awhile and I enjoy reading the articles. I love the honest assessments. I'm afraid I don't know any other Spies. If I do, I'm unaware. Where are you from? What is your home course? I'm from Anniston, Alabama, and my home course is Pine Hill CC. What are the best and worst things about golf in your region?﻿ The best is that you can play almost year-round. The worst is that it can get awfully hot and humid at times. What do you do for a living? I'm a business professor. How’d you pick your user name?﻿ 2 of my favorite apostles. Thanks for the opportunity! I would love to test the new JPX EZ Forged irons. I am James, from Anniston, Alabama My handicap is 18 - 20 (not absolutely sure the exact number) My current irons are Callaway Razr XF's, with stock shafts, regular flex. I was not custom fit for my Razr XF's (though I desperately wish I had been so fit). Just wanted to quickly say hello. New member, though I've been "spying" on the site for awhile now.